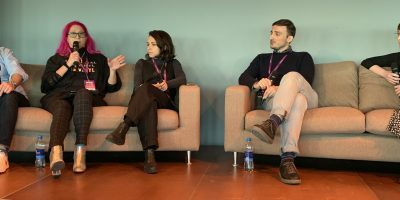 FastForward prides itself on doing things a bit differently from other music-industry conferences, from its diverse speakers and youthful audience to its now-traditional alcohol-fuelled closing panel, with its promise of less-guarded views on the industry’s key trends. Cue this year’s session, with panelists including Communion Music’s Chris Scott; PPL’s Mark Douglas; Remote Control Agency’s Pat Carr; CI’s Summer Kim; and musician Roxanne de Bastion, who works with the Featured Artists Coalition and runs the From Me to You conference. The moderator was FastForward founder Chris Carey. She said that the question of who’s going to provide the data required by some of this technology remains key: is it the artists and songwriters? The labels and publishers? Will the labels provide information on the publishing? “Do you think sound recording companies care about publishing, and can you believe that information?” she said. de Bastion said she’s excited about the work being done by Imogen Heap and her Mycelia project in this area. 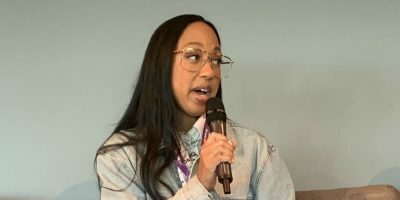 “It’s interesting to me that it’s the artists together with tech startups that are trying to come up with solutions to these problems,” she said. The panel fielded a question about whether all the talk about pitching for Spotify playlists is doing the artist community a disservice: suggesting that getting a track on a playlist is all that’s required to get a career up and running. “All streams are not created equal,” said Scott. There are artists with 20m streams that have come from playlists, who aren’t selling tickets. And there are artists who have much less streams but are playing to packed venues. “Most people here are trying to build artists over time, and that’s about tickets, it’s about merch,” she said. “Those playlists, they’re designed to be background music,” said Carr. “You can suddenly get millions of streams because you’re on a playlist, but there’s no connection,” added Carey. “I think people have been talking about this for a very long time. VR is a very interesting add-on, but I don’t think it’s ever going to replace a real-life experience,” said de Bastion. What about a holographic Roy Orbison going on tour? “It’s just a different thing isn’t it? It’s a thing that exists that people might enjoy, but it’s not the same thing as being there to watch the actual artist,” said Scott. 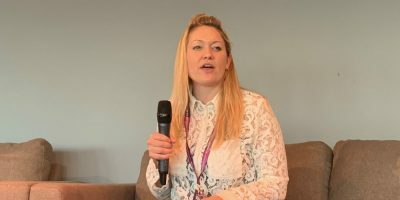 “If you’re willing to turn up to watch something virtual, you’re admitting there’s something unique about the experience of watching with other people,” said Douglas. “If you only had that sort of thing, where would the new Roy Orbisons come from?” asked Carr. The next question focused on markets like India and China: are streaming services like Saavn and QQ Music as important for the future of music as western-centric topics like Amazon Echo and Spotify? “This is anecdotal, but in a certain major label, planning meetings have to start with ‘international’ at the top of the agenda. Anyone who’s been in a major-label planning meeting knows international used to come at the bottom of the agenda,” said Scott. “That means the next one’s coming from Scotland, because we’re good at silly dances,” quipped Douglas. Kim said that the music industry is more open to tracks that aren’t in English, including K-Pop band BTS, who’ve been breaking in the US. Collaborations will be an important part of this, which may benefit some genres where it’s baked in to the culture, more than others. “What do radio stations respond to? Something that’s already got a proof of concept… If a new artist has been on a hit, now they’re a guaranteed hit. And in my world, rock and indie bands don’t do that: it’s not in the culture, which makes it difficult to thrive,” said Scott. How can the music industry restore confidence from investors? “It’s naturally emerging,” said Kim. “There’s more money coming in to it, and they [investors] are more interested in it. The next question focused on diversity and inclusion. “The decentralisation of the industry has been a good thing for gender equality in general,” said de Bastion. “This whole ‘MeToo movement and isn’t it great that we’re having this conversation now? I think no. Isn’t it shocking that we’re only just having this conversation now?… I take great solace in that there’s a lot of great people doing very interesting things.” She sees space emerging for more stories to be told and new leadership models to emerge. The final question: how will the industry make sure that musicians’ incomes will be sustainable, and support their wellbeing if they are not? “With streaming and everything else, it’s actually elongating bands’ careers. The 80s, 90s playlists, there’s people I have worked with who are now discovering bands from the 90s or the early noughties who they never knew,” said Carr.